When tunnels are excavated with conventional drill and blast operations or via mechanical excavation for softer material, the quickest way to support is the use of shotcrete. This method is called Sprayed Concrete Lining (SCL) in the UK and in other countries it is named as New Austrian Tunneling Method (NATM). In reality NATM is more than just the sprayed concrete lining and erroneously every tunnel support utilizing shotcete is named NATM but another post will cover this issue. In this post I would like to make some points regarding the use of fibers or wire mesh in the reinforcement of shotcrete used for tunnel support. A great amount of literature exist regarding this issue and even more laboratory tests verifying that it is better to use fibers to reinforce shotcrete. This is because the shotcrete becomes more ductile when fibers are used in relation to just plain shotcrete and ductility is good in tunnel support. The issue is what happens in larger displacements? When the shotcrete will crack? Would we want shotcrete to crack? How much cracking is acceptable? And if cracks occur does fibers or wire mesh do a better job? When you excavate a tunnel you would like to have a ductile support that can accommodate some displacements. In this way you stabilize your tunnel using the ground as a supporting element and at the same time you gain in cost by using a lighter tunnel support. This is clearly demonstrated with the convergence – confinement diagrams (fig 1). In the stiffer support the yield point (failure of support) is where the stress – displacement becomes horizontal, in the less stiffer and more ductile the yield point is not clearly defined but you could argue that at some point the displacements become too large with little offered additional support. The equilibrium point is when the support stress – displacement curve meets the rock stress – displacement curve. If the support has not reached the yielding point, then you have “supported” your tunnel. If the yield point (for simplicity, the horizontal portion of the line) is beyond the rock curve then your support has failed to support the tunnel. Back in our issue, what type of reinforcement to use? Steel fibers or wire mesh for tunnel support? In the following photograph an area in the tunnel can be seen where too much displacement has taken place. The shotcrete has been severely cracked but is still standing and some support is offered due to the presence of the wire mesh (and bolts). If the shotcrete was reinforced with fibers and such displacement had taken place, large chunks of shotcrete would had detached and fallen. This could harm personnel and equipment. 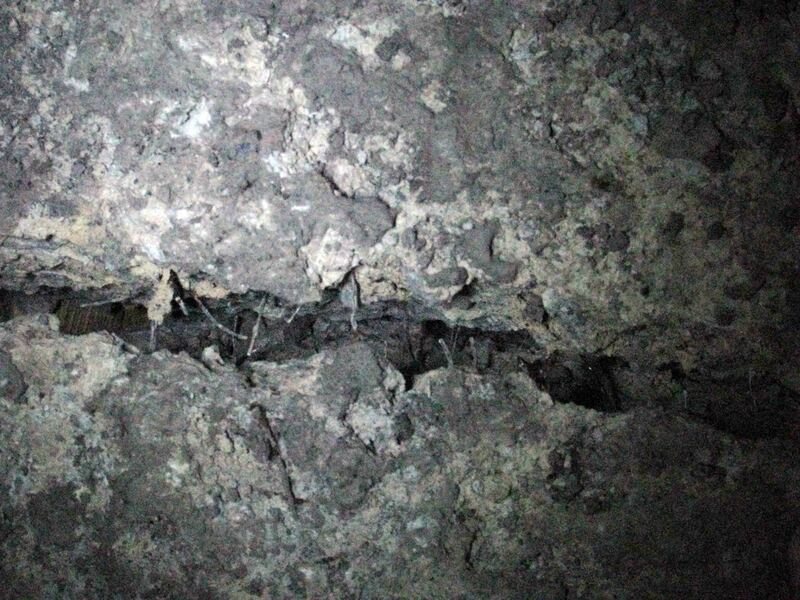 This can be seen in the next photo where a crack has formed in fiber reinforced shotcrete and a gap where the fibers have been detached from the shotcrete. During construction, the use of fibers is more easily executed because the labor to erect the mesh is more time consuming. Also the mesh may not be able to follow the profile if inappropriate blasting has been executed in hard rock. 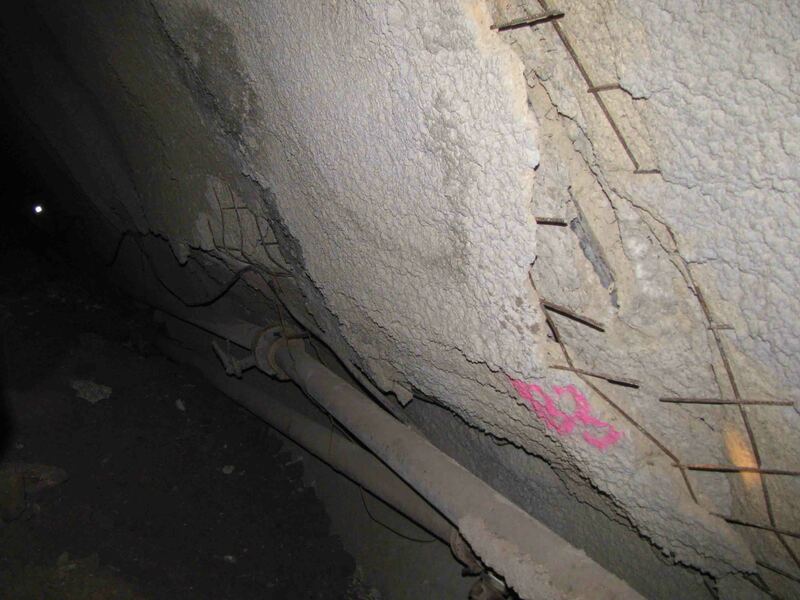 On the other hand steel fibers are abrasive and can produce maintenance problems to the shotcrete equipment, are more dangerous for injuries during spraying and can more easily be “reduced” by the contractor without anybody knowing. So coming back to the question of what type to use in tunnel support, one could argue that when you anticipate large displacements you should use steel wire mesh (maybe in collaboration with fibers) and when you anticipate small displacements steel fibers are appropriate and adequate. In any case the primary support selection for tunnel construction requires careful and meticulous planning. The use of wire mesh can at least protect workers of uncontrolled collapse of shotcrete chunks in severely displacing rock masses. David Oliveira has posted in his popular and highly scientific LinkedIn group Underground Geomechanics some very interesting comments and has promoted significantly the discussion. Please visit and contribute if you like. Thanks David!